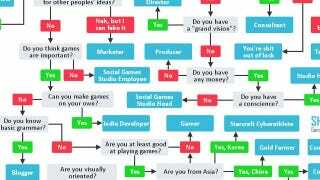 Indie dev Martin Nerurkar wants to help you get your dream job in the video games business. And he's helping by giving you a brutal dose of reality. Not everybody can, or should, be a producer, concept artist, creative designer or lead programmer. Sometimes, you just need to settle for what's most suitable for you. I'd get all upset and ask which member of the games press pissed in his coffee for our appraisal, but most of them are a little on the rough side, so I'll let it slide. Because the truth, as they say, hurts.